Retailing for just about half a million dollars, the A. Lange & Sohne Tourbograph Perpetual Pour Le Merite watch is truly something to marvel at. The mega-complicated watch now also includes a perpetual calendar. The A. Lange & Sohne Pour le Mérite line was first launched in 1994 and has seen a number of additions to the family since then, with each new piece more daring and innovative then the last. The first piece ever released was the Tourbillon Pour Le Merite, and it came equipped with fusée-and-chain transmission. Then, 2005 saw a new model released with the complications of the original and the addition of a chronograph with Rattrapante function. The release was the manufacturer’s most complicated watch at the time. The A. Lange & Sohne Tourbograph Perpetual Pour Le Merite watch is a study in technical excellence. 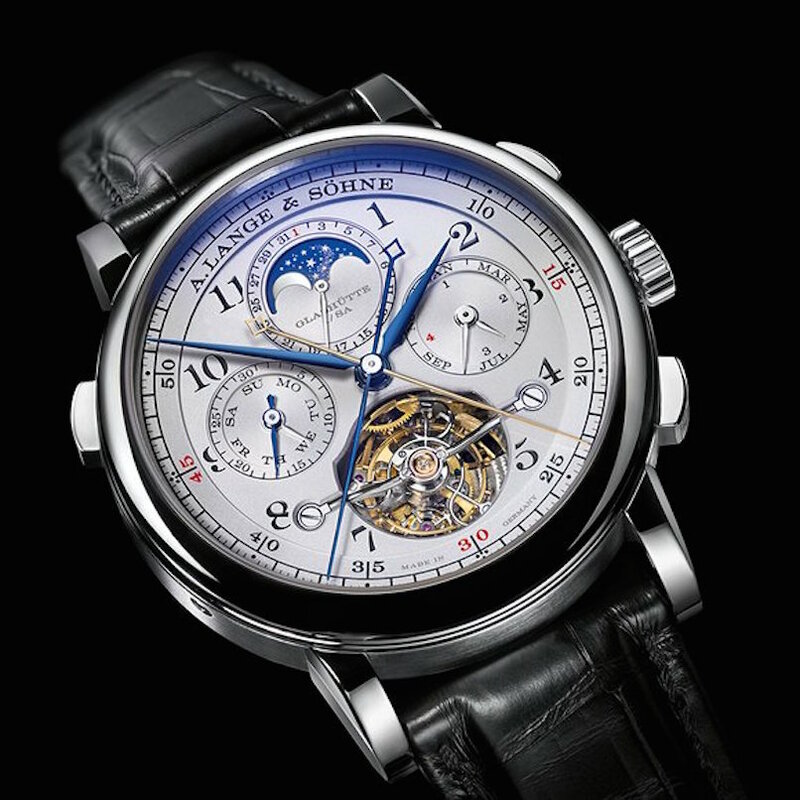 This year, with the unveiling of the A. Lange & Sohne Tourbograph Perpetual Pour Le Merite, the brand reaches new heights. To really understand the horological marvel that is this watch it is best to break it down by each of its complications. First the perpetual calendar. In integrating the perpetual calendar, the engineers insisted during the research and development stages that there would be no mechanical conflicts that could result in inefficiencies such as unwanted or unnecessary energy loss throughout the movement. 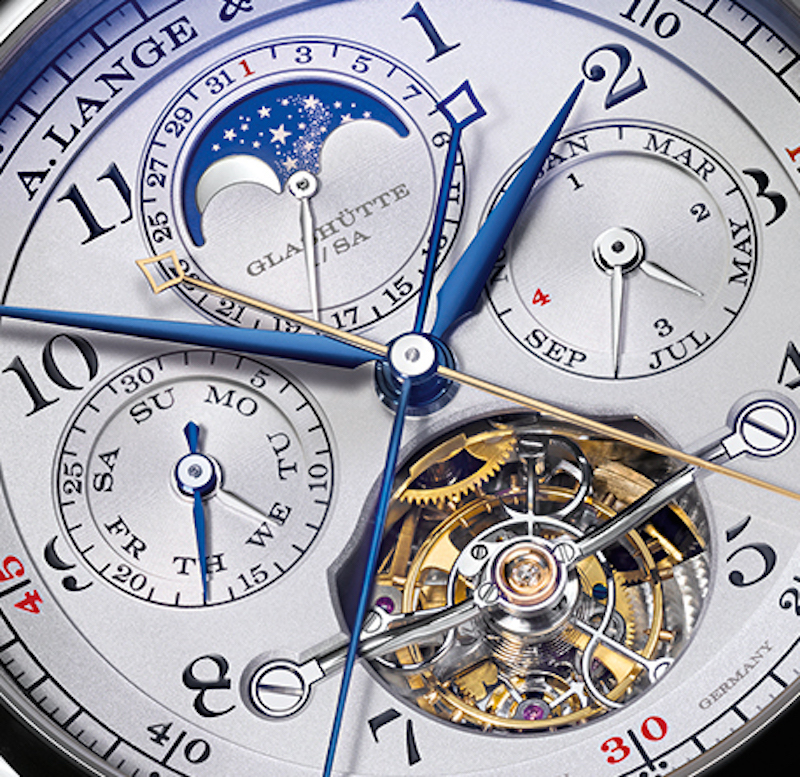 To achieve this the perpetual calendar had to be built around the tourbillon. As a result about two thirds of the surface of the movement was available to work with and not surprisingly required a redesign of the caliber. Adding to the challenge is the fact that the developers did not want to add unnecessary height or weight to the piece. 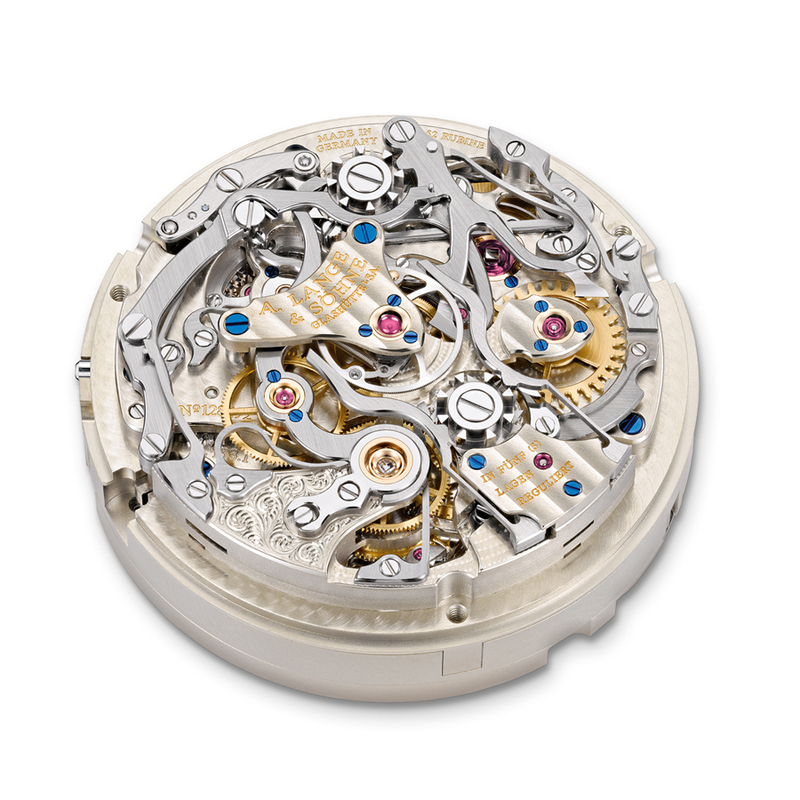 Of the 684 parts of the caliber L133.1, no fewer than 206 pieces account for the perpetual calendar and its displays. The calendar will correctly keep track of each month until the year 2100, and at that point in time will require a one-time correction for the last day of February (because in that year we will skip a leap year to sync time with the Gregorian calendar). After the correction, the watch will remain accurate for another hundred years. The date, month and year are all clearly legible on the dial. 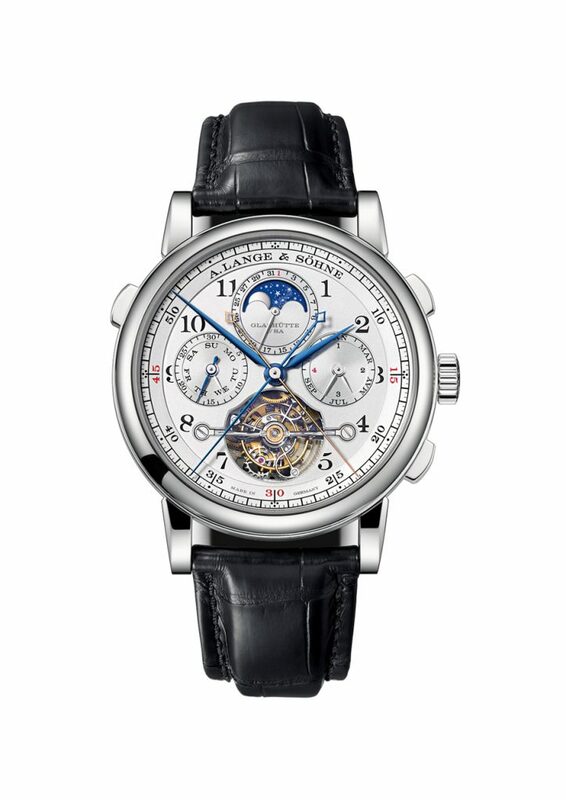 The complex caliber of the A. Lange & Sohne Tourbograph Perpetual Pour Le Merite watch consists of more than 600 pieces. A journey around the dial showcases the date can be found at the 12 o’clock. The day at the 9 and the month and leap year at the 3 o’clock. The moon phase is located in the date subdial, is finished in a striking out deep blue and will remain accurate for 122.6 years. The dial also features Arabic numerals, railway track minute scale, blue steeled hands for the time and rhodium gold hands for the calendar, as well as the cloverleaf arrangement of the subsidiary dials pay tribute to the famous A. Lange & Söhne pocket watches. The caliber of the A. Lange & Sohne Tourbograph Perpetual Pour Le Merite watch is meticulously finished. In understanding the one-minute tourbillon we have to first discuss the fusée-and-chain transmission and its purpose. The complication is meant to serve as a tool to help mitigate and limit energy loss from the mainspring barrel. With a chronograph, tourbillon and perpetual calendar, there are a number of energy reliant complications to take note of. The fusee and chain protects the flow of power from the mainspring to the movement in constant increments. That paired with the one-minute tourbillon offer two elements within the watch that combat factors that detract from accuracy. The tourbillon counteracts the accuracy dampening effects of gravity on a watches movement while the fusee and chasing counter acts the loss of power that occurs when winding a watch. Intricate hand finishing includes Glashütte ribbing and perlage, hand-engraved bridges, thermally blued screws, screwed gold chatons, bridges and plates of untreated German silver and more. All of this horological goodness somehow fits in a 43mm case. So, with all of the mechanics and mystery out of the way, let’s cut to the chase. The watch is a work of beauty and balance. From the stunning Moonphase disk that is just the perfect shade of blue, to the harmoniously placed sundials and the open-worked toubillon — the A. Lange & Sohne Tourbograph Perpetual Pour Le Merite watch keeps the eye trained on it. The platinum case offers a smooth, warm hue and a great fit and feel. The combination of chronograph, perpetual calendar and tourbillon is like wearing a tour de force on the wrist and the chain and fusee remind you of the horological history that has been modernized by the brand for what may be a pefrect watch. Only 50 of these incredible A. Lange & Sohne Tourbograph Perpetual Pour Le Merite watches will be produced in platinum – each retailing for just about $500,000.